My Thoughts: If you’ve followed Literary Obsession for any length of time, you know I have a love for fairytale retellings. Even if it’s an author I’m absolutely not interested in, if they publish a fairytale retelling, I’m going to jump on that ship. It’s just a thing. 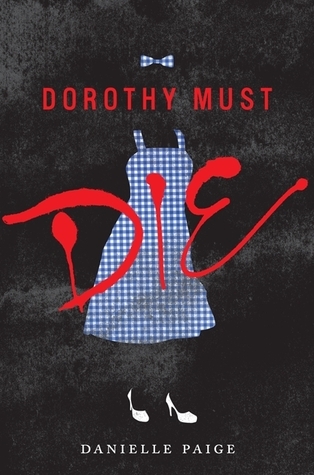 So, despite being on a buying ban and deciding I wasn’t going to review books anymore and all that fun stuff, when I heard about Dorothy Must Die, I had to have it. I pre-ordered it, read it the day it downloaded onto my Nook, and it’s what thrust me back into the world of book blogging. It’s just -good-. Danielle Paige’s debut was quite honestly thrilling. I haven’t read a YA book, or a fairytale retelling, or a debut book, or any combination of the above that was so interesting, well written, and engaging as this one was in a long while. Amy was absolutely fascinating as a protagonist and, in my opinion at least, was absolutely relatable to the age group (and older). She came from a pretty bad life and rises above without being overly dramatic or insanely silly. Again and again the author surprised me with twists and tidbits that made me smile or groan – but you know, in a good way. In general, the writing was crisp and smooth while being easy to follow and not at all dumbed down. Some of the things I did not love as much all of which made this an entirely pleasant read and one that I’ll likely do again as soon as the sequel comes out. Now, while I easily enjoy this nearly as much as I enjoyed Wicked, there are some portions that made me cringe. The author seemed to fixate on our antagonist’s sexuality pretty heavily rather than leaning more heavily on other actual evil things. Hopefully there’s less of that in the second book. Honestly, though, aside from that bit – I loved this book. I loveloveloved it. It’s awesome. If you’re interested in a reimagined version of the world of Oz, go grab this book. Be prepared for nothing to be as you expect it to be if you’re familiar with the original, and come back and let me know if you enjoyed all the little details the author slipped in from the classic story.